Doors wear over time, due to burglary attempts or extreme weather conditions but you have nothing to worry about since the technicians of FC Locksmith in Toronto have the knowhow to fix any problem of any door. Our company has a very long experience with many door styles ranging from wood or steel front doors to sliding and French doors. We are adequately equipped, offer 24 hour services and are here to provide immediate door repair. 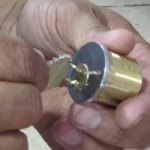 All main entrances from front and back doors to balcony and patio entrances must lock well and both their materials, strengths and latches must be resistant. From loose handles to problems of French doors locks, damaged rods and worn panels we have the knowledge, expertise and tools to repair them fast. We carry some of the greatest equipment in Ontario and can serve commercial and residential clients even beyond Toronto. All repairmen are trained to repair any door made of any material with efficiency. Each door has a different locking system and is made of different materials and dimensions. Our Toronto locksmith specialists can surely consult you about ways to maintain the door and locks in good condition and assist you when you need to buy new ones but they also specialize in door repair and promise 24/7 assistance. After all, the condition of doors is important to your security. A worn door could be kicked down by potential burglars or reduce the level of your security. 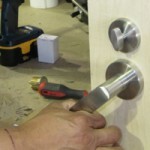 When there is a problem with your door, trust the experienced FC Toronto locksmith door specialists.